31 Aug When Should I Have Surgery For Spinal Stenosis? Spinal stenosis is caused by general ‘wear-and-tear’ changes in an individual’s spine. These changes can occur with age and cause weakness and pain in the legs. Symptoms can range from mild to intense. Spinal stenosis causes weakened legs, back, and buttocks, as well as numbness in the legs. There are two types of spinal stenosis: Cervical and Lumbar stenosis. This pain becomes worse when the patient walks or moves. Sometimes, people also experience low back or hip pain along with this activity-related leg discomfort. It is relieved only when the patient rests for a significant period of time. Your doctor will recommend an MRI or a CT scan to diagnose spinal stenosis. You can discuss different surgical options with a qualified surgeon. X-rays are helpful in discovering any changes, such as bone spurs that have narrowed down the space within the spinal canal. In most cases, MRI is the best imaging method of choice for diagnosing spinal stenosis. Generally, the need to have surgery for spinal stenosis is when an individual’s physical activity gets restricted too much due to severe pain. If non-operative treatments, such as epidural steroid injections or anti-inflammatory medications fail to take effect, your doctor may recommend surgery to treat the condition. If patients have tried numerous other methods but the pain does not respond to any treatment, they may require surgery. 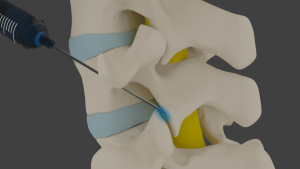 What Are Different Surgery Methods To Treat Spinal Stenosis? One of the most common types of spinal stenosis surgeries is decompressive laminectomy. This type of surgery relieves pressure on the spinal nerve roots and removes parts of the vertebrae and thickened tissue. In a few cases, spinal fusion is done at the same time to keep the spine stable. This surgery fuses two or more bones so the joint can no longer move. This is not the most recommended type of surgery as it is risky and can complicate things, if not operated right. A large number of patients benefit from a less-invasive procedure, such as insertion of an interspinous process spacer that alleviates symptoms, without the need for a laminectomy. However, not all patients are eligible for this surgery. Although many people successfully manage uncomfortable symptoms with a modified lifestyle and pain-relieving medication, exercise and physical therapy are also recommended to ease the pain. Because spinal stenosis is not progressive, the pain can strike at any time. Many patients cite the nature of this pain to be episodic and not chronic. For this reason, thousands of patients do not feel the urgency to have surgery for spinal stenosis.